In April 2009, the world’s largest funding platform was created. Kickstarter was built to bring creative projects to life and has currently funded over 120,000 projects. Through these campaigns, the creator can tell their story and give back to those who donate as a thank you for funding. Some projects give back in the form of completed albums or signed posters while other projects step a little outside the box. One of those unique projects involves Rebekah Todd’s latest record, Crooked Lines. Following her 2011 EP Forget Me Not and her 2014 LP Roots Bury Deep, Todd wanted to head back into a studio that, after careful consideration, was out of her budget. She also knew that she wanted to market a publicity campaign which was another price that was not in her budget. She took the time to research her possibilities and did the math, resulting in a campaign that needed to earn $30,000. After reassurance from her fans that they were willing to support the campaign, she launched her Kickstarter on April 18, 2016 and ran it for 45 days. Like a number of Kickstarter campaigns, it began on a high note before tapering down in the middle. Her networking skills were put to the test as she reached out to anyone she could think of to help fund the campaign. With a mere 48 hours left, Rebekah was able to reach her goal and ended up with a total of just a little over $32,000. To add her own special touch to the campaign, Todd put her Bachelor’s degree to use. She attended East Carolina University and graduated in 2010 with a major in Painting and Drawing. By using her home studio, she created nearly 30 pieces as rewards. Adding that personal touch was not only a unique reward for fans but was also therapeutic for her. Crooked Lines was released February 17 and was her step outside of her comfort zone in more ways than one. Her last album was a reflection on her father’s passing and explored more of a darker theme, while this album proves to be more uplifting. Although the initial track “Trouble” is about her father, there’s a more optimistic approach that differs from her last LP. Other noteworthy tracks include “Wandering Soul”, a track originally recorded for her first EP, and “Let Me Prove My Love”, a powerful song both lyrically and musically. 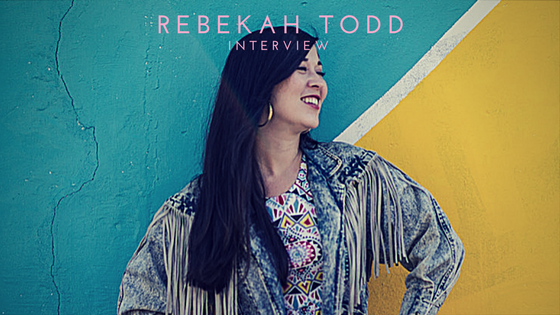 With this newfound confidence and all-around happiness, Rebekah Todd’s latest record is set to instill hope in others that she found through music. She has been able to keep her head up during trying times and has found therapeutic ways to keep her going. Maybe Crooked Lines will do the same for you.